Dogs seem to go everywhere with their owners in the Bay Area, but there are some places pet pooches simply can’t go: restaurants, grocery stores, farmer’s markets. State law says “no animals are allowed in a food facility except service animals.” But some pet owners have found a way around that rule and it’s become much more than a pet peeve for people with disabilities who have real service dogs. “It makes my life a lot more difficult than it needs to be,” said Alex Wegman. The San Jose resident was born with an incomplete spinal cord, making it difficult for her to walk without a wheelchair. She relies on her service dog Bright, a yellow Labrador trained by Canine Companions for Independence. Wegman said when untrained pets are somewhere they shouldn’t be, like a restaurant with loud noises, food, and other stimuli, it can create all kinds of problems. While it’s difficult to track exactly how often people are passing their pets off as service dogs, Wegman said she sees it often, even recounting an occasion when a Cavalier King Charles spaniel walked into the retail shop where Wegman works. She said the dog kept trying to engage with Bright, while the owner ignored it. “It was wearing a fake service vest,” said Wegman, “and it was on a Flexi lead.” Wegman said service dogs are almost never on retractable leashes and trained handlers would know not to let their dog distract another working dog. 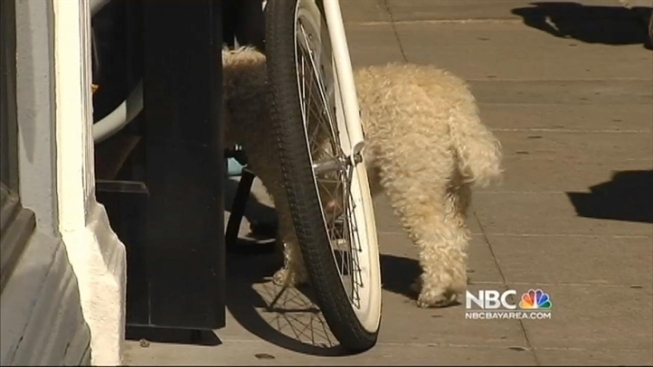 The Investigative Unit went undercover and found several dogs roaming around with their owners at the Fort Mason Farmer’s Market in San Francisco. Some of the owners claimed to be confused by the law while others explained how to get around it. “Who really knows, I’m kind of over it in general,” another owner said while laughing. “I usually don’t listen to any rules and regulations until I get headed off you know. Too much sheep in our society,” a third dog owner said while smuggling his dog through the market, tucked under his arm. Under the ADA, business owners can only ask two questions when someone with an animal walks in: “Is this a service animal?” “What is it trained to do?” Any inquiry beyond those two questions and businesses know they open themselves up to litigation. Meanwhile cheaters know if they answer correctly, there’s no proof required. Richard Lee is the Director of Food Safety for San Francisco County. According to Lee, animals are prohibited from food facilities to prevent the spread of allergies and potential disease. In the past two years San Francisco had the most complaints reported by any Bay Area county involving animals inside a food facility. Lee said after inspectors gave businesses signs to post warning patrons that “fraudulently misrepresenting service animals is a misdemeanor,” complaints fell. “Two years ago  we saw 44 complaints and last year we saw 17,” Lee said. It is a misdemeanor offense to pretend your pet is a service animal in California. Still, that doesn’t seem to stop some people from trying to game the system. Multiple websites sell official looking ID cards and “service dog vests” to anyone. Unlike people who use disabled parking placards, people with service animals are not required to register anywhere. The Americans with Disabilities Act was written that way to protect the privacy of the disabled. But that’s also the part of the law that makes it easier to abuse since there’s no ID cards or special tags required to prove whether a dog has been trained as a service animal. Canine Companions for Independence (CCI) CEO Corey Hudson says it’s time that changed to crack down on service dog fraud. “There needs to be some standard organization [where] somebody neutral who is knowledgeable about the situation judges whether that dog is a legitimate assistance dog,” Hudson said. He and CCI are now lobbying the Department of Justice for help. Adding to the confusion, the designations of "therapy dog," "comfort dog," "emotional anxiety dog," among others. In California, none of those animals is considered a "service dog" when it comes to food facilities, according to Penny Si, the ADA coordinator for SFPD. "A service animal has to be individually trained in specific tasks that benefit a disabled person. An emotional or support animal is such because the presence of that animal provides security. If it's their mere presence, if that's all they're doing, that doesn't meet the requirements of a service animal," said Si. You can also tweet @vickydnguyen or follow her on Facebook.